People should stop jumping from planes if they are not experts! 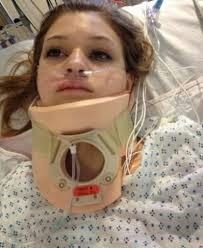 Makenzie Wethington in hospital after surviving a 3,000 ft fall! A 16-year-old girl survived a horrifying ordeal after falling 3,000ft in a skydiving accident. Makenzie Wethington is in a good condition according to surgeons, despite multiple injures including damage to her liver, pelvis, lumbar spine in her lower back, shoulder blades and ribs. Despite the odds, the teen is currently receiving treatment in an intensive care unit and is expected to leave soon. The teenager’s sister Megan told local news that the primary parachute didn’t open and Makenzie spiralled out of control towards the ground with her father, who jumped first, watching in horror.